I had heard about the infamous Thickshakes from Whisky Business so when we were in the area we had to stop by. Unfortunately, I didn’t get to try one of their macarons which people were lining up to buy. Offering an all day breakfast – the lunch menu is somewhat limited. There are plenty of breakfast options from pancakes to waffles to green eggs and ham! The menu was overall quite expensive with most meals ranging from $15-$20. As I was definitely getting a Thickshake I was after something small and savoury. 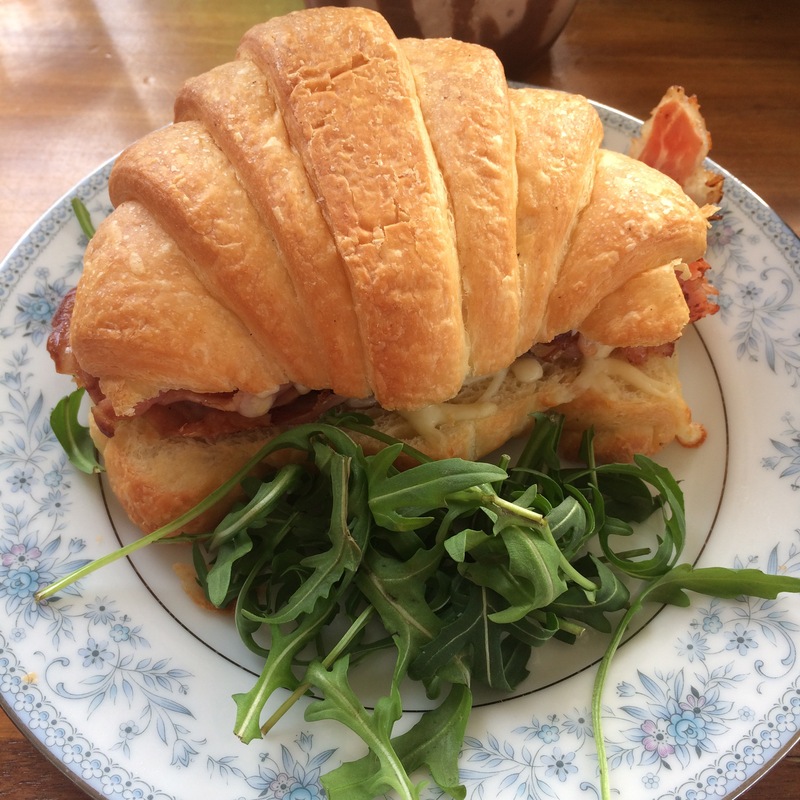 Unfortunately after deciding on the homemade Sausage Roll with Chilli Jam which was sold out I decided on a Homemade Ham and Cheese Croissant $10. 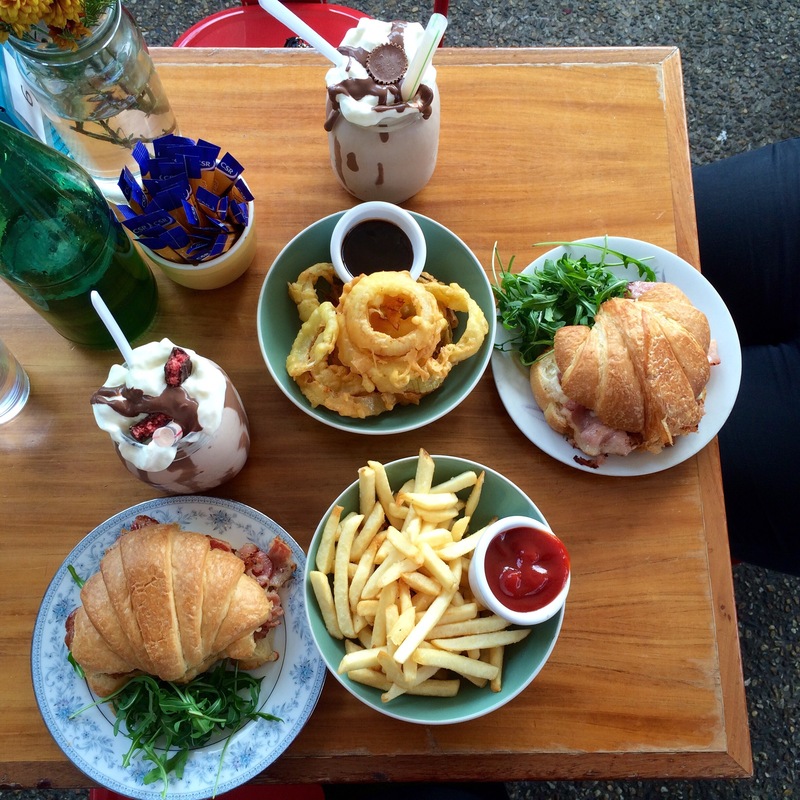 My sneaky partner ordered the same Crossiant and hot chips AND onion rings for us to share! The chips were average but the onion rings were lightly coated and delicious. Here comes the most important part…. The Thickshakes! The two specials were Ferrero Rocher or Reece’s Peanut Butter Cup then to make the decision harder the menu included flavours like Pineapple Lumps, Malteser, Cherry Ripe, Tim Tam, Nutella there were more but I cannot remember them all! 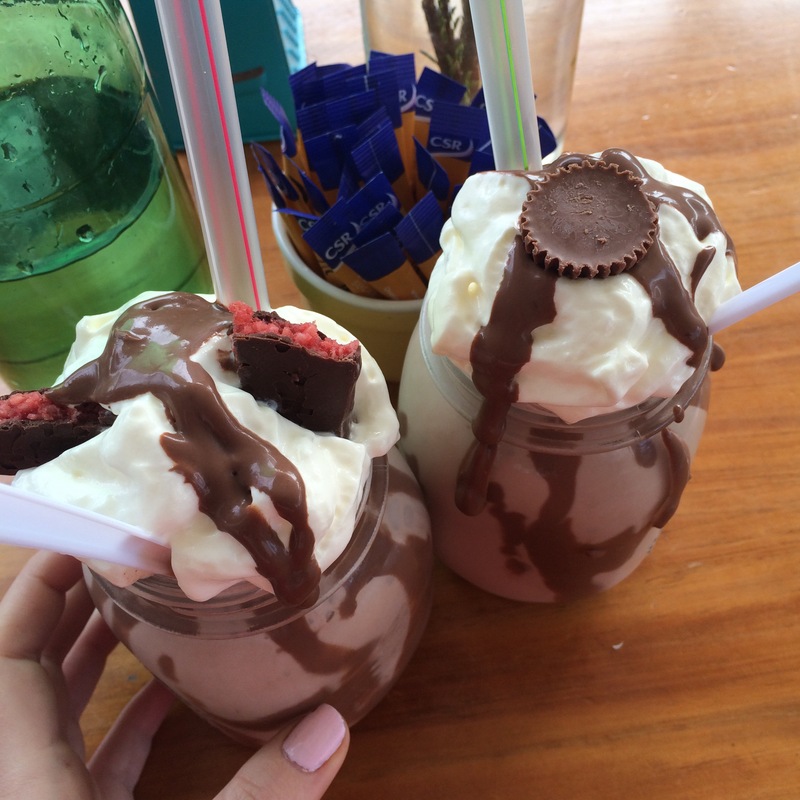 We decided on the Reece’s Peanut Butter Cup and Cherry Ripe Shakes $8.90 each. The Peanut Butter Cup Thickshake was filled with reese’s peanut butter pieces and had the perfect ratio of peanut to chocolate. 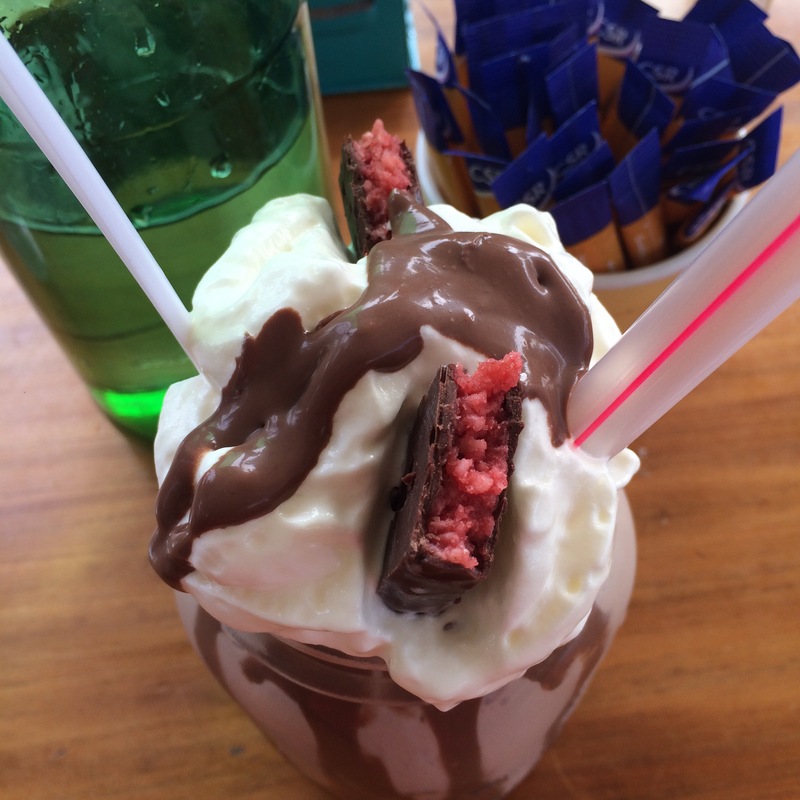 The Cherry Ripe Shake was very decadent – topped with whipped cream, melted chocolate and Cherry Ripe. The shake was coconutty and super thick! Whisky Business is located on the Capalaba end of Old Cleveland Road (200). I was surprised to find that it was in a shopping complex. There was plenty of outdoor seating with colourful mismatched chairs and fresh flowers on the table. Disappointingly the service is what tainted our experience at Whiskey Business. Our food and drinks arrived very quickly. Unfortunately the staff were not welcoming or caring. The Verdict: The Thickshakes were the big winners today. The food was tasty and an odd but convenient location. Overall 8/10.